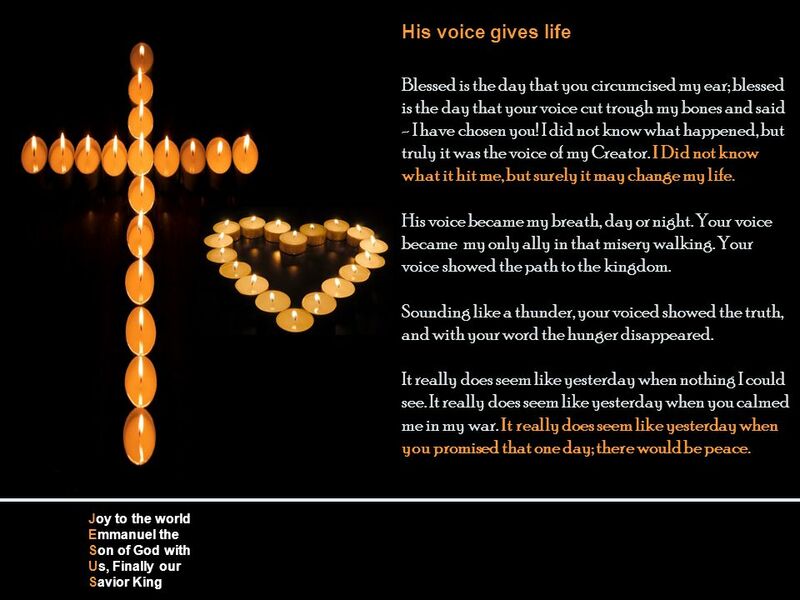 His voice gives life Blessed is the day that you circumcised my ear; blessed is the day that your voice cut trough my bones and said - I have chosen you! 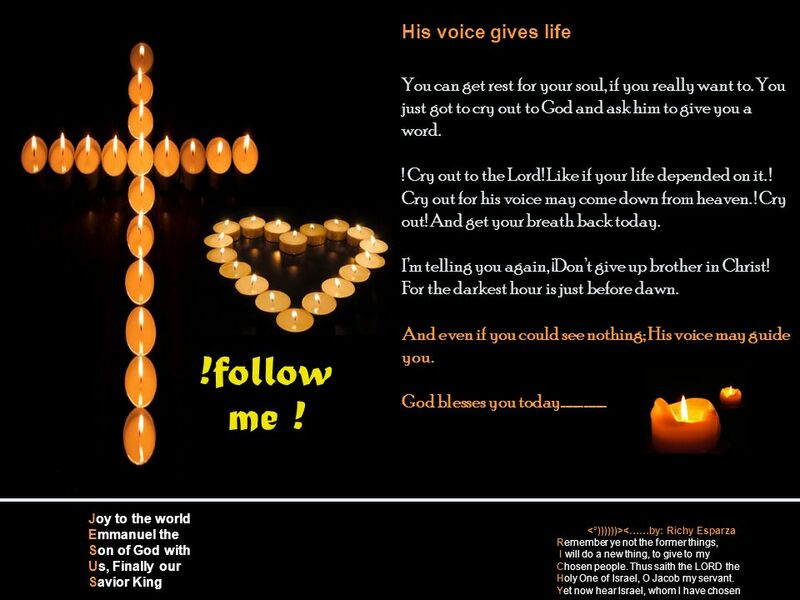 Download ppt "His voice gives life Blessed is the day that you circumcised my ear; blessed is the day that your voice cut trough my bones and said - I have chosen you!" 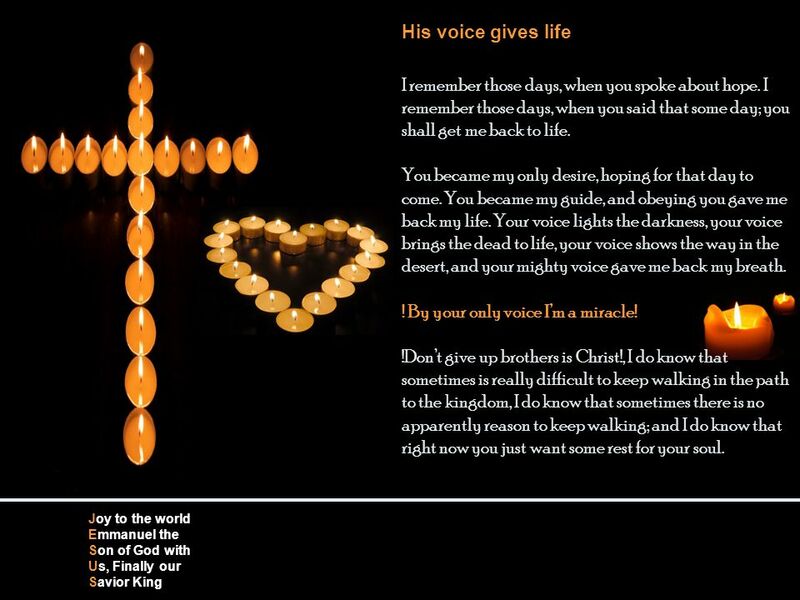 Made in the kingdom of heaven My boss (Jesus) is good my brothers, for last summer he sent me on vacations to Dallas. While I was there, I visited the. Joy to the world Emmanuel the Son of God with Us, Finally our Savior King Jesus paid for it Why the sadness?, how come you are still trying to find yourself. Blessed Are We !. Blessed are we who dwell in the Lord’s House, we who will be still praising Him Psalm 84:4 Night and day wherever we may be, for He. From the beginning From the beginning  John 1:1-4  In the beginning was the Word, and the Word was with God, and the Word was God. He was in the beginning. My Savior Lives. Here the bells ringing They're singing that we can be born again. WILL MY DREAMS EVER COME TRUE? Will My Dreams Ever Come True? Lessons that we already see! 1. Introduction to the Holy Spirit. 2. The PERSONALITY of the Holy Spirit. 3. The Deity Of The Holy Spirit 4. The work of. Today we once again light the candles of hope, peace, and joy. We also light the fourth candle, the candle of love. We start today’s celebration with. Second Sunday of Lent. Alleluia, Alleluia, Christ is with us He is with us indeed Alleluia And so we gather. In the name of the Father… Mr. Wood.